This in fact was the first crime/thriller novel I've ever read by a South American author. The booksellers' shelves here in New Zealand aren't exactly weighed down with translated South American crime fiction, but I was very pleased to spot this in Unity Books recently. 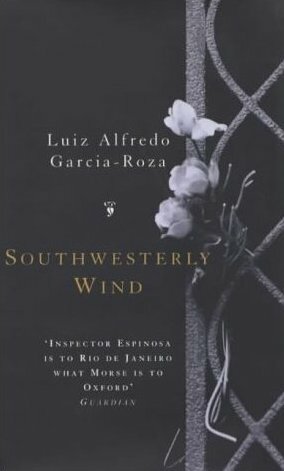 In SOUTHWESTERLY WIND, Chief of the Copacabana precinct Espinosa is more than happy to interrupt his paperwork when a terrified young man arrives at the station with a bizarre story. A psychic has predicted that he will commit a murder, it seems, and the prediction has become fact in the young man's mind. It's a case more appropriate for a psychiatrist or philosopher, but, rising to the challenge as usual, Espinosa slowly enters the web of a psychologically conflicted man. As the weather changes and the southwesterly wind - always a sign of dramatic change - starts up, what at first seems like paranoia becomes brutal reality. Two violent murders occur and their only link is the lonely, clever man who has sought Espinosa out a few days earlier for help. I quite enjoyed this book, although it was a little slower-paced than most crime and thriller novels I read. In a way, the plot and story unfolds, unhurriedly - rather than racing along. I enjoyed Garcia-Roza's descriptions of Rio de Janeiro, a city I visited in early 2008, and it was quite an intriguing set-up, with the young man becoming increasingly erratic due to the paranoia and fear brought on by the pyschic's prediction. You wondered whether things might become a bit of a self-fulfilling prophecy because of this. At times however, it felt like both the reader, and Espinosa himself, were just waiting to see what would eventually happen. The Police Chief, although an intriguing character, was pretty reactive - although that is probably quite authentic in a way. Rather than getting out there and doing much investigating, he often waited for things to happen, or the storyline of the book only moved forward once another character came to Espinosa with something. Perhaps that's being picky however. Garcia-Roza does a nice job of evoking Rio de Janeiro, and may be going for a 'realistic' version of the drudgery and procedure of police work. Although it wasn't particularly exciting, at times it was absorbing, and I was curious to know how things would unfold. It was a good book, and I would read more of Garcia-Roza, although perhaps not race out and read him ahead of others on the TBR pile. This book was read and reviewed for Dorte Jakobsen's excellent 2010 Global Reading Challenge.